Missionaries of Our Lady of La Salette arrived in Poland on 16th September 1902. The first five priests initially lived in Kraków. The second religious house was opened in Puźniki, where also the seminary was founded. In 1910 the Missionaries opened another house in Dębowiec near Jasło, organizing there the minor seminary as well as the novitiate and seminary internum for the students. In 1921 the Missionaries began publishing the magazine La Salette - The Messenger of Our Lady of La Salette. The following years helped to develop the Congregation on Polish ground. In that time more houses were built and established (Stanisławów, Hurko, Kobylanka, Lwów, Rzeszów and Ostrowiec). As well as working in Poland, Polish priests took up missionary work abroad in the United States (Ware, Westfield, Olivet), Argentina (Cordoba, Rosario, Santa Fé, La Plata) and Canada (Beauséjour, Ladywood, Elma). Finally, in 1934 the Polish province was officially established. The Polish Province included all houses in Poland, Argentina and some in the United States and Canada. During World War II the Polish province lost five priests who died in the bombing of Lwów. After 1945 the Missionaries were forced to leave their posts in Lwów and Stanisławów. The Polish Province ministered for Polish congregations in Argentina, the United States and Canada contributed to the establishment of two Vice Provinces (1958): Argentine and American Olivet. Shortly after the World War II the Polish Missionaries opened new posts in Trzcianka, Bircza, Lubrza, Dytmarów, Biała, Lubsko, Gdańsk-Sobieszewo, Kuźnica Czarnkowska, Kraków, Warszawa, Resko, Łętowe, Zakopane, Olsztyn, Elbląg, Prabuty, Królew Malborski, Rzeszów-Zwięczyca, Łapsze Wyżne, Mrągowo, Mysłowice-Krasowe. In 1952 the communist government took away from the Missionaries the buildings in Dębowiec, Rzeszów and Hurko and prevented the realization of the state policy of the lay apostolate. During that period the Missionaries focused on parish work and formed informal formation groups of lay people. The period of political transformation in Poland of the 90's, which was associated with greater freedom and a positive impulse to the development of the Church in Poland related to the pontificate of John Paul II, led to new works. During that period, publishing house La Salette was established in Kraków (1995) and publishing of the magazine La Salette - The Messenger of Our Lady of La Salette was resumed (1995). Apart from that the Fund for Children and Youth under the name of Our Lady of La Salette was created (1998). The purpose of that Fund was to support large families, children and youth from poor families and single parents. At that time, also in Dębowiec, a Polish maternal house of the Province and the major centre of worship of Our Lady of La Salette in Poland, a statue of Our Lady of La Salette was crowned with papal crowns on 15th September 1996. After a period of rapid development, the beginning of the twenty-first century was marked by a decline in the number of vocations. At that time, new work, related to challenges of a changing world, was established: in 2008 a formation place called Reconciliation Center La Salette was established in Dębowiec, and in 2012 Information Centre of Missionaries of Our Lady of La Salette was opened in Kraków. In 2012, the Swiss Province was merged to the Polish province forming so-called a Swiss district. Missionaries of Our Lady of La Salette currently work in parish ministry (Dębowiec, Gdańsk-Sobieszewo, Kobylanka, Kraków, Kuźnica Czarnkowska, Łapsze Wyżne, Łętowe, Mragowo, Olsztyn, Rzeszów, Trzcianka Lubuska and Warszawa) as well as specialize in: leading parish missions and retreats, spiritual direction, schools of prayer, and catholic schools. They are also involved in teaching and research work at universities and at their own institutes. In different ways they support social institutions of the Church, especially charity. They run retreat houses in Dębowiec, Mrągowo and Zakopane. 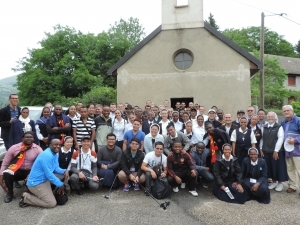 The Polish Province sends missionaries to work in Madagascar, as well as running pastoral work in various places abroad, spreading devotion to Our Lady of La Salette in the following countries: England (Dagenham, Goodmays, Harlow, Rainham, St. Ives), Belgium (Bruly-de-Couvin, Couvin, Jéhonville, Paliseul), Belarus (Dalekie, Widze), the Czech Republic (Bozkov, Mělnik), Germany (Aldersbach, Aufhausen, Bayerbach, Engerazhofen, Friesenhofen, Sammarei, Simbach bei Lindau), Liechtenstein (Balzers), Slovakia (Chrenovec, Povazska Bystrica), Switzerland (Mörschwil), Ukraine (Busk, Krzywy Róg, Łanowice, Nikopol, Zaporoże). Rectors of the Polish Province of the Congregation of the Missionaries of Our Lady of La Salette were: Michał Kolbuch (1934-1950), August Gauthier (1950-1952), Bronisław Młynarski (1952-1958), Stanisław Zawisza (1958-1964), Władysław Baran (1964-1970), Franciszek Danioł (1970-1979), Józef Mituś (1979-1985), Adolf Grotkowski (1985-1988), Antoni Skałba (1988-1994), Augustyn Hamielec (1994-1997), Józef Krzyszycha (1997-2003), Lesław Pańczak (2003-2006), Władysław Pasiut (2006-2012), Andrzej Zagórski (2012-). Until 1880 the history of the Congregation of the La Salette Missionaries in France is indistinguishable from the history of the Congregation in general. All the communities were situated in the diocese of Grenoble: at the Shrines of La Salette and of Pipet in Vienne, in Corps and in Grenoble. The founding of an apostolic school in 1876 prepared the extension of the Congregation beyond the borders. In 1880 a group of missionaries left for Norway; of the eleven La Salettes, seven were scholastics! The following year saw another new frontier, this time in nearby Switzerland, with the founding of a scholasticate in Le Valais. Before long, Swiss seminarians were joining the young Frenchmen. In the course of the last years of the nineteenth century, French members left for North America and Madagascar. Soon after, others would leave for South America and Poland. Meanwhile, the Congregation had taken root in various parts of France: in the center, at Noirétable, taking charge of the ancient shrine of Our Lady of the Hermitage (1889); near the Mediterranean, at Mont Saint Clair in Sète, where a La Salette shrine already existed (1898); at Villeurbanne near Lyons (1899), founding an orphanage. But all that changed when, in 1901, the French government adopted a law making it impossible for religious congregations to exist without a special authorization, which was very rarely granted. We had to leave our Mother House, the Shrine of La Salette. The houses in Grenoble (rue Chanrion) and Corps (Saint Joseph) were confiscated, along with a recently opened house in Châtillon-sur-Chalaronne, close by the parish of the holy Curé of Ars. To give an example of the absurd situation thus created: Frs. Angelier and Gachet were condemned to prison sentences for having continued to live at Our Lady of the Hermitage! Any La Salettes wishing to minister in France had to conceal their identity as members of the Congregation. Formation houses had to go into exile; in 1901 a house was founded in Tournai, Belgium. It provided safe haven for the apostolic school and later the scholasticate as well. The First World War (1914-1918) brought about, indirectly, a distinct change in Church-State relations. Religious were able to return to France. In 1914 the La Salettes took on a youth ministry in a poor neighborhood in Paris. Then they returned to Grenoble, Corps, Our Lady of the Hermitage and finally, in 1943, to our Mother House at the Shrine. They preached parish missions and took charge of parishes. Apostolic schools were once again opened in France. The last one, founded in 1950 in Voiteur in the east of France, not far from Switzerland, would continue in existence for over thirty years. The scholasticate was ultimately established at Alaï-Francheville near Lyons, in a house which, during the war, had served as the seat of the General Administration of the Congregation. If this presentation of the history of the Province of France is to be considered objective, we need to add some painful details. At the end of 1968 the Province had 165 members, among them 102 priests (not counting those in Madagascar). All of them had entered the Congregation in France. According to the most recent statistics (the end of 2010), there are now only 39 members who entered the Congregation in France. The last ordination of a French-born member of the Province goes back to 1978! Houses have had to be closed for lack of personnel. Reinforcements have arrived, fortunately: twelve priests and one deacon coming from other Provinces, first Poland, then South America, Madagascar, Africa, Asia. 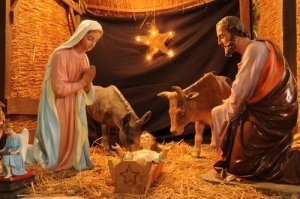 With their help, a new house was founded in 2007 in the Archdiocese of Besançon, where we have assumed responsibility for the Marian shrine of Our Lady of the Oak. In 1936 Burma was granted home rule and administratively separated from India. With the arrival of five Missionaries in November 9, 1937 in Akyab (Sitwe) led by Fr. Thomas Newman, MS, the history of one of the most difficult mission territories entrusted to the Missionaries of Our Lady of La Salette began. Arakan (Rakhine) state, even though geographically closer to India (later became East Pakistan) (Bangladesh) was a part of Burma (Myanmar). The Arakan section of the territory that was entrusted to the Holy Cross Fathers was given to the La Salettes. It was isolated and the only way to reach it was by ship. The trip could take two or three days from either Rangoon (Yangon) or Calcutta. Though Akyab was the center of the mission, most of the activities were in the southern part in Sandoway (Thandwe). Fr. Tom was flat with Malaria when he heard that Fr. Weslak, MS one of his companions was sick and could not go there himself. When he heard that he was getting better he went to Akyab to see the last of the Holy Cross Missionaries off. Before he arrived on the 14th Fr. Tom heard that Fr. Weslak died on Feb. 13, 1938 from what sickness no one knew. But then the mission had to go on. With more missionaries coming in, the mission looked promising. Prome (Pyay) from Rangoon was added to the Mission. World War II broke out in 1942. Fr. Phil Gardener, MS was murdered around that time in Aunglan near Prome (Pyay) by robbers but it was not till after the war to look for his body buried in a shallow grave, identified by his pocket watch. The height of the missionary activities began after the war. Since the country was still a colony of the British Crown, obtaining visas was relatively easy. That situation changed after independence from the British on January 4, 1948. No more permanent visas were issued and it became more difficult to get even temporary visas. The Burmese political leaders were assassinated on July 19, 1947. Only one was saved. He did not attend the shadow cabinet meeting due to a bad dream. There were so many problems in the country. The military was given the reign of country and elections took place after a few months. On March 2, 1962 General U Ne Win took over the country and the situation went from bad to worse. The riots and the massacre of many students in 1977 and 1988 were the darkest moments in the history of the country. Another election was held in 1990 but those who won never got to serve since there was no valid constitution. The Missionaries never gave up hope though. They started the Apostolic School (minor seminary) in Akyab in 1962. They sent their first student (Bernard Taylor) abroad to the Philippines in 1963 to study. His visa was limited to the Philippines, Thailand and Hong Kong. Due to the nationalization of the private schools (the La Salettes lost four schools) the minor seminary was closed permanently in 1965. When the seminary was closed, Fr. Noonan, MS, started to build up the native diocesan vocations and he sent them to the seminary in Taunggyi. He had to leave the missions because his visa, like other foreigners, was not renewed. Around that time a Catholic forest officer was assigned to Prome who had a son studying Theology in Rangoon. Bishop Newman pleaded for him for the diocese from the Archbishop of Rangoon and finally in 1967 Fr. Cornelius Kyaw Khine was ordained by him as the first native priest in the missions. In the seventies there were more native clergy: Fr. Bernard Taylor and Fr. Raphael Pho Seh in 1972 and Fr. Peter Maung Yin in 1973. When five more new priests were ordained for the diocese in 1975 the La Salette Missionaries decided to handover everything to the native clergy. Bishop Joseph Thaung Shwe took over the diocese in February of 1976. In November 1976, after 39 years of presence, the last two of the Missionaries of Our Lady of La Salette, (Frs. Charlie Gendron and Mike Blumm) left Myanmar. 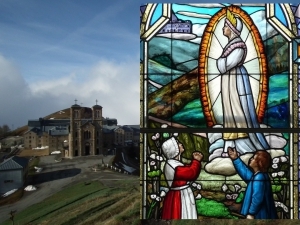 The Latent Period: The La Salette Missionaries left, but devotion to Our Lady of La Salette was kept alive in the diocese. Fr. Bernard Taylor left the diocese in 1979 to join the La Salette Missionaries in the Philippines. The physical absence of the missionaries never stoped the people from honoring our Blessed Mother under the title of Our Lady of La Salette. The New Beginnings: Fr. Taylor started recruiting for the La Salettes in Myanmar in Mid-90. Soon Myanmar seminarians were in Silang, Philippines together with their Indian brothers. Four Myanmar La Salettes took their first vows on May 1, 2000 and they were ordained priests on May 4, 2004. After a couple of exploratory trips to Myanmar the General Council decided to re-establish the Myanmar Missions in 2005. On November 18, 2005, the La Salette Missionaries started to administer to the Marian Shrine of Our Lady of the Rosary in Chanthagone, the parish there and the neighboring parish in Myauk Kine and Myitnge quasi-parish. Thanks to the support of the Bishop, priests, religious and the people of Mandalay, the new missionaries became adjusted to their native land and culture after a very long absence. The "saffron" revolution took place in 2007, it was a difficult year. The bloody demonstrations led by Buddhist monks forced the postponement of the ordination of Fr. Thomas Htang Shan Mong, MS to a later date. The dignitaries (the Apostolic Delegate and the Superior General) were unable to come. So the first La Salette ordination took place at Mandalay on October 26, 2007 at the Shrine of Our Lady with Archbishop Paul Grawng doing the honors. 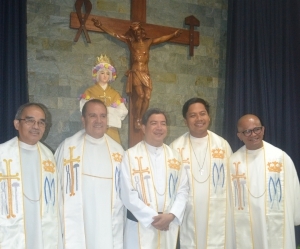 Three more priests were ordained in 2008 and another group of three more were ordained in 2009. With the last group ordained, the first part of the history of the young Mission came to its conclusion. 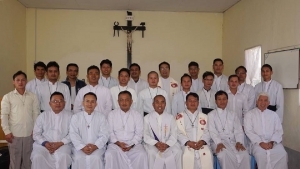 Now we take care of the diocesan Marian Shrine of Our Lady of the Rosary, four parishes (Chanthagone, Myauk Kine-Myitnge, Zawgyi and Sinbyu) and three in the diocesan seminaries. Besides these regular duties, the Missionaries have been involved in giving retreats, workshops and seminars / training programs, to Bishops, priests, Religious and lay people. A "spirituality center" has been established in Chanthagone with financial help from the Congregation of Propagation of Faith. A new central house is almost finished. This will provide a quiet private haven for the missionaries. The big storm, Nargis, brought out the generosity of many of our La Salette brothers and sisters. Restrictions of private organizations and persons to help the victims were strictly enforced. No matter how strict the laws may be there are always some ways of getting around them. With the help of some relatives and friends, Fr. Taylor was able to reach a lot of farmers, orphans and other victims. The building of a dispensary had to be stopped because the government took over the plot because it was very near the bridge they were repairing. Looking Forward: With the help of regular "study days", the missionaries are looking forward to "make the message known". Accepting the invitation of Our Lady to "come closer", the missionaries are trying to establishing a well rounded program of apostolate, recruiting and formation. 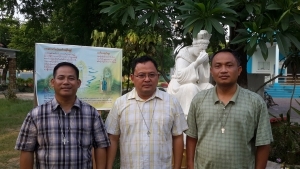 Studies are being made to extend the missions to Myitkyina (where the La Salette Sisters are). There are two candidates in the Philosophy department and four volunteers ("Come and See!) who want to join the community. Within a year or two some will be ready for postulancy and novitiate. The challenge is not to spread out too thin and yet try to help the local church and the La Salette Community as much as possible. Discerning what Our Blessed Mother at La Salette has in mind for the missionaries, they will have to make the best of whatever scarce resources they have as gifts from God, Our Mother, the Community and friends and relatives. Recruitment will have to start. La Salettes have the advantage of the being the third male pontifical congregation (the others are Salesians and Brothers of the Christian Schools) in the country with native members. Though it may take a while, a Myanmar program of La Salette formation is being planned. December 18, 1902 marks the date of the arrival of the first La Salette Missionary in Brazil, Fr. Clément Henri Moussier, authorized by a General Council decision (Superior General Fr. Joseph Perin), made at the meeting of 16-18 April, 1902. Over the years, other French priests (Léon Perroche, Eugène Beaup, François Burdin, Paul Charton, Paul Ravier, Jean Helme, Augustin Poncet, Henri Mao, Paul André Duguet, Paul Simon Baccelli, Adolphe Philibert, Pascal Rochedreux, Célestin Crozet) and brothers (Alfred Villard, Raphael Rozec, Jean Creff, Edmond Bettaz, Raymond Babotin) arrived. Later, there were Swiss priests (Alphonse Bovier, Albert Allaman, Franz Xavier Hoegger, Fidelis Willi, Etienne Graven, Edouard Summermater, Joseph Raschele, Joseph Graff, Leo Sarbach, Erwin Kauffmann), North American priests, (Francis Paul Allard, Francis Amos Connor, Theodore Brandley, John Bric) and scholastic brother Thadeus Wizikowki. Italian, Fr. Giuseppe Nuzzo. Polish, Frs. Arthur Dudziak, Robert Janowski. Fr. Moussier and other La Salettes who arrived over the years began their ministry in the interior of the State of São Paulo as chaplains to the Sisters of Saint Joseph of Chambéry, in Itú, Jaú, Campinas, and as pastors of Sacred Heart parish in Santa Cruz das Palmeiras (1907). By 1904 they moved to the capital, São Paulo, where Fr. Moussier was named (August24, 1904) pastor of Saint Anne parish and chaplain to the secondary school of the Sisters of St. Joseph of Chambéry, in the Santana quarter. With the arrival of two other missionaries (Alphonse Bovier and Jean Helme), the first La Salette community in Brazil was established. Frs. Moussier and Bovier exercised their ministry in the capital, São Paulo, and Fr. Helme in the interior, in the little town of Jaú. At the heart of Fr. 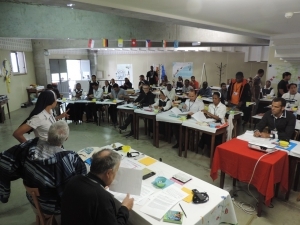 Moussier's missionary zeal lay a great dream: to create a solid base for the Congregation and erect a Shrine dedicated to the Virgin of La Salette in the federal capital, Rio de Janeiro, political and administrative center of the country. In the second half of 1911 Fr. Fidelis Willi spent three or four months in Rio de Janeiro as chaplain to the Sisters of the Holy Angels, to explore the possibilities. On July 16, 1913 the Missionaries of La Salette bought land in the poor Catumbi quarter, to establish a residence and build a small chapel dedicated to Our Lady of La Salette. In April 1915, the local La Salette community decided to take up a collection to build a large parish church. On January 20, Cardinal Joaquim Arcoverde blessed the cornerstone of the Shrine of Our Lady of La Salette. On November 13, 1927 Cardinal Sebastião Leme presided at the solemn inauguration of the new Shrine. * The idea of founding a minor seminary was considered as early as 1911, but the war (1914-1918) and other problems postponed its realization for another 17 years, 26 years after the arrival of the first La Salette Missionary in Brazil. The search for a location for the seminary led to Rio Grande do Sul where the missionaries were welcomed gladly by the bishop of Santa Maria, Ático Eusébio da Rocha, who created a parish for them in Marcelino Ramos, naming as the first pastor Fr. Augustin Poncet. The bishop also authorized the construction of a seminary on parish land, March 12, 1923. Fr. Louis Sorrel, delegate of Fr. General (Fr. Célestin Crozet), accompanied by Fr. Fidelis Willi and Fr. André Duguet, officially opened the seminary on July 2, 1928, in a small wooden house. The first seminarians arrived the same day. Construction of a more adequate seminary began in 1930 using plans designed by Fr. Picard, General Treasurer, who came to Brazil to oversee the work. On March 23, 1931, the delighted seminarians moved into the new house which still had no doors or windows. The first profession of Brazilian La Salettes took place in 1933, and the first priestly ordination (Fr. João Neukirchen), en 1938. The Region of Brazil was erected as the "Immaculate Conception" Province in 1934, during the mandate of the Superior General Fr. Etienne-Xavier Cruveiller. First Provincial Superior: Fr. Simon Baccelli. * Three members of the Province exercise their pastoral ministry in Germany, in the region of the Rottenburg-Stuttgart diocese. They are assigned specifically to minister to Portuguese speaking people. They regularly serve many communities scattered in the towns and villages. 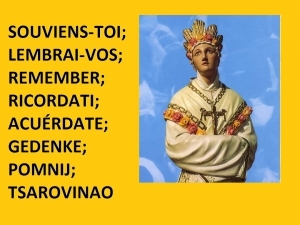 * In this continent-country, the message of Our Lady of La Salette, is well known. Dozens of small chapels, parishes and shrines are dedicated to her. Six shrines are served directly by the La Salette Missionaries: Rio de Janeiro (in the State of Rio de Janeiro), Marcelino Ramos (Rio Grande do Sul), São Paulo (São Paulo), Curitiba (Paraná), Caldas Novas (Goiás), Várzea Grande (Mato Grosso). * 1. Joint novitiate: For many years the novices for the Region of Argentina and the Province of Brazil have made their novitiate together. Depending on circumstances, an agreement is reached to decide whether it will be in Brazil or Bolivia. 2. Vocation promotion: the Province of Brazil has two centers, one in the south: União da Vitória (Paraná), and one in the northeast: Salvador (Bahia). Initial formation for seminarians and religious is provided in six houses: União da Vitória, Curitiba, São Paulo, Belo Horizonte, Salvador (2). 3. Parish Missions: Since 1963 the La Salette Missionaries have had wonderful experiences evangelizing the people through grassroots missions. But it was in 1980 that these were given official standing with the creation of the "La Salette Mission Band," composed of missionaries and laity. After thirty years it is still extremely dynamic, bringing the Gospel and the message of La Salette to hundreds of parishes and communities. 4. "Salette" magazine: founded in 1917 and published ever since, it is almost 100 years old, with thousands of subscribers in the north and south of Brazil. * In 1966 Immaculate Conception Province experienced a resurgence with the creation of the "Mission of Bahia," based in the city of Valença while providing ministry in other parishes. Today we can be proud of our presence in this northeastern state, from which a good number of priests and seminarians in the Province have come. Cujubim: Amazonia: The missionary spirit continues to meet new challenges without being discouraged. The Province responded (2008) to the missionary call to go to far-off Amazonia to serve the parish of Cujubim in the diocese of Porto Velho, in the State of Rondonia. Alagoinhas: Taizé spirituality: Listening to the Spirit has once again presented a highly unusual challenge, in partnership with the Brothers of Taizé, at the Spirituality Center in Alagoinhas in the State of Bahia. February 1978 was a time in the history of the congregation of the missionaries of our lady of La Salette. Rev. Fr. Efren Musngi, MS, then Provincial Superior of the Ina ng pag-Asa, the vice-province, Philippines, made a decision to participate in the conference of the Major Superiors of the Religious congregations of Asia which was held in Bangalore. The key note speaker of the conference was Rt. Rev. Dr. Antony Padiyara then Arch-Bishop of Changanaserry who became the Major Arch-Bishop and the second Cardinal of Kerala. Cardinal Padiyara was a devotee of the Blessed Virgin Mary. The encounter between (Fr. Musngi and the Cardinal) the two sons of Mary should naturally bear some fruit. The Arch- Bishop invited Fr. Musngi to spend few days with him in the diocese which he gladly accepted. 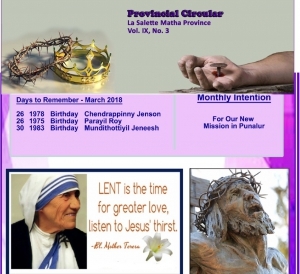 The Prelate promised him all the assistance in recruiting candidates to our congregation and thus making La Salette presence in India, especially, in the Syro-Malabar Chruch that has centuries old Christian tradition even before the arrival of missionaries from Europe. Fr. Musngi was thrilled with the response of the Bishop and went back to the Philippines. Few months later he went to Switzerland to participate in the Council of the congregation and presented his encounter with the Bishop and the council accepted the proposal of Fr. Musngi and promised their blessings and support. They entrusted the duty of recruiting the candidates to the Philippines Province. As soon as Fr. Musngi returned to the Philippines he started preparations and send Fr Orlando Sapuay, MS, and Fr. William Slight, MS, to India and with the assistance of the Bishop and the priests of the diocese they made their first recruitment from India. 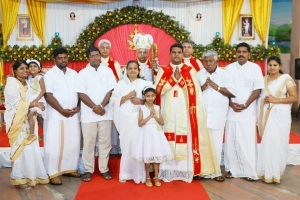 The first batch of Indian candidates, Mathew Manjaly, Augustine Cheerakathil, and Deacon Philip Pazhayachira reached the Philippines in 1979 and began their formation. Then the following year Fr. Rutillo Mallillin was sent to India and recruited Jose Kuzhinjalil, Joseph Punnakunnel, Deacon Andrews Kollannoor, Chukkanaickal Joy and Job Callarackal. On the 1st of May, 1981 Jose Kuzhinjalil and Joseph Punnakunnel became the first Indian la Salettes to make their religious profession. On the 5th of December 1985 Andrews Kollannoor, the first priest from India, was ordained to the priesthood. Meanwhile the recruitment was continued through Rev. Frs. Efren Tomas MS, and Manuel Medina MS. In 1988 Fr. Jose Kuzhinjalil, MS came back to India and he was welcomed by the Diocese of Trivandrum to a small parish, St. Joseph's Church, Vamanapurm. 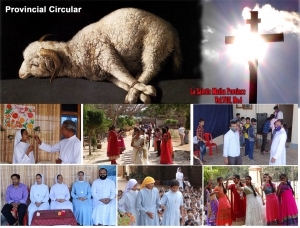 Thus, the active presence of the La Salette missionaries began in India. The same year Fr. Joseph Punnakunnel joined Fr. Jose K. and together they began recruiting candidates to the minor seminary. 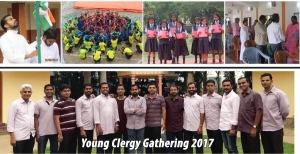 The first group of minor seminarians was accommodated in the diocesan centre called Better Life Movement, Aloor, Irinjalakuda, while the candidates who had finished their philosophical studies were send to the Philippines. Then the following year Fr. Andrews came back to India and with the help of his brother Fr. John Kollannor, CMI, the community purchased an old hospital of the Carmelite sisters in Parakkadavu. After due modifications and renovations this house was officially blessed on the 17th August 1990 and was named La Salette Bhavan, the first house and the minor seminary in the sub-continent of India. 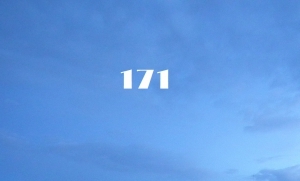 Then on the community began to experience a real growth in the number of the membership and the ministerial presence. 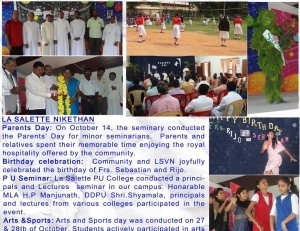 In 1997 we began our second house, La Salette Sadhan, in Bangalore and in 1998 the third house, La Salette Nikethan at Hunsur, Mysore as the formation houses. During these years the Superior General together with his council and the whole congregation encouraged and helped the young Indian mission to strive together to envision the dream of the mission. All the Provinces and Regions together with our Mother Province and the North American province extended their generous hands in our needs. In 2001 India became a Region and Fr. Mathew Manjaly, MS, was elected as the first Regional Superior. 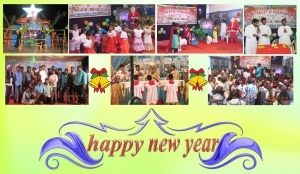 In 2003 we began the school ministry, La Salette Vidyanikethan, at Hunsur, Mysore, for the poor village children. In 2005 we started our mission in North Kerala by opening a centre for family counseling and retreat, La Salette Ashram, Mananthavady. Through the great support and inspiration of the Generalate, especially Rev. Fr. 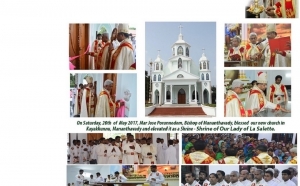 Isidro Perin and the congregation at large India became a Province in 2007 and Fr. Andrews Kollannoor, MS, was elected as the Provincial Superior of the newly erected La Salette Matha Province. 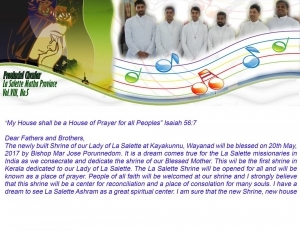 In 2010 we blessed our mission house, La Salette Nilayam, in Andhra Pradesh. Today the Province is blessed with 36 Priests, 21 scholastics, 56 seminarians and 5 houses in three States of India ministering to the people of God through our School, retreats, counseling centers and parish ministries. We add life to the provinces of the Philippines, America, France, Italy, Argentina-Bolivia and the Generalate through our sharing of membership. 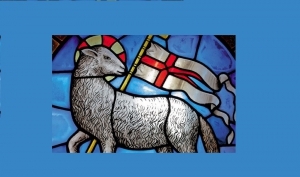 The new presence of the province in the dioceses of Parramatta and Canberra in Australia is well appreciated by the bishops and the Christian communities. The community today under the leadership of Fr. Jojohn Chettiyakunnel, MS, the present Provincial superior, is trying to realize the vision and mission of the province. As we start the preparations for the Silver Jubilee of our presence in India, we express our heart-felt gratitude to God the Almighty and to all the General administrations of the past and the present, the Provincials, the Regional Superiors, the members of different provinces and all those who helped us to become what we are today. With the words, "Make this known to all my people," Mary showed her people the urgency of being reconciled with one's neighbor and with God, a "vertical and horizontal" reconciliation. Mary demonstrated this urgency through the tears shed for her people. She herself was a missionary of this reconciliation. She came from afar, from above, to meet two young shepherds in the mountains! 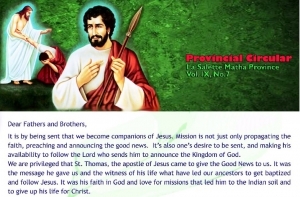 That is what the Swiss La Salette Missionaries did when they came to Angola, over sixty years ago, to share with us this reconciliation, which is first and foremost a Gospel message. This message motivated the lives and the commitment of this men who came from afar. La Salette has been present in Angola for 63 years, precisely since 1946, the hundredth anniversary of the Apparition. On their arrival, the missionaries did not know the people of the country, they knew nothing of their culture, and they did not know the language either, just a few snippets of Portuguese. So they had to deal with learning the local languages, especially Umbundu, the language of the majority of the Angolan population. But the problem of languages was not going to stop them! We need only recall that the message itself was given in French and in dialect. If Mary's message could have been blocked by the language barrier, it would not be heard today in so many countries, it would have fallen to the ground and become like smoke on the horizon. Here are the names of the first Swiss missionaries in Angola: Emílio Truffer, Rafael Meichtry, Eduardo Jud, João Baptista Damann, Otmar Schweizer, Justo Villiger, João Meier and Roberto Harder. We owe them all our gratitude, and they deserve our unending respect. 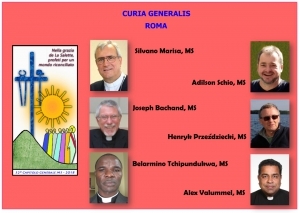 Today there are only four Swiss priests in Angola: Luis Keller, Francisco Eggs, Viktor Andereggen and José Oehri. These four are not part of the original group. The Missionaries carried out the enormous task of translating books in the fields of theology and spirituality, liturgy and vocation ministry, as well as prayer books. Frs. Joaquim Hatewa, M.S. and Roberto Harder, M.S. (Swiss) played an important role in the founding of the "Sisters of St. Catharine." The presence of the Sisters of Our Lady of La Salette on Angolan soil is due is large part to Fr. Joaquim Hatewa, M.S., an Angolan. The publication of the CD, "Vozes da Reconciliação," which means "Voices of Reconciliation," is the brain-child of Fr. Adriano Elias, M.S. and which is therefore part of the apostolic work of our missionaries. Fr. Adriano is even now recording the second edition. Reconciliation remains a great challenge for Angola. Even though the civil war is over, the country is still deeply scarred by a past that cannot be very easily forgotten. It was an Angolan war, but it was highly influenced by forces outside the country. Friend fought against friend, brother fought against brother, family against the same family. The wounds of war remain open; much more time will be needed before they are healed; hearts are still estranged. The war of arms and bombs may be over, but the war of cultural, tribal and ethnic prejudice continues. Reconciliation in Angola is "urgent with a great urgency." Spurred on by their charism, the La Salette Missionaries dedicate themselves without ceasing to reconciling wounded and resentful hearts. The war has left in its wake many persons who died, often in cruel ways. Some have lost father, mother, brothers and sisters, cousins, nieces and nephews, etc. In certain cases we know who killed whom. The tendency is to want to avenge the atrocities committed. The La Salette Missionaries are opening paths of reconciliation at a time when Angola is preparing for September's legislative elections. And this is a call to work seriously to free ourselves from the situations dating as far back as 1992. Just as the seed fallen on the ground must die in order to bear fruit, the Missionaries opened seminaries for the training of Angolan La Salette Missionaries. This openness led to the growth of numerous religious and priestly vocations, both for La Salette and for the diocese. Today, La Salette in Angola can count on a large and constantly growing number of vocations: the "hundredfold." Angola has four formation houses for the different levels: Propedeutic (preparatory program), Philosophy, Novitiate and Scholasticate. The Scholasticate will soon be transferred to Benguela, once the building of the new Scholasticate in Cavaco-Benguela is finished. For the time being Philosophy is in Benguela, but once decent lodging is available in Huambo (in the center of the country), Philosophy will return there. We can say that from the point of view of formation Huambo is the bastion of the Region, because in the past it was the house of philosophy and the scholasticate. But because of the war, everything had to be moved to Benguela, on the coast, where it was possible to enjoy relative security. God has blessed the Region of Angola with numerous vocations. Current statistics demonstrate this clearly. 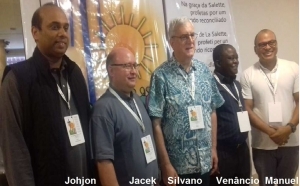 At this time La Salette in Angola has 64 priests, 2 deacons, 3 brothers, 21 temporary professed, 2 novices and 162 seminarians (counting the 19 in temporary vows) in Propedeutic, Philosophy and Theology. We also have members outside of Angola: in France, Italy, Namibia, Portugal and the United States, working in pastoral ministry or pursuing studies in a variety of fields. Our Regional House is situated in Catumbela. These are the ministries served by members of our Region: in Angola: Mission of Catumbela, Mission of Hanha, Mission of Malongo, Mission of Ndunde-Ganda, Mission of Tchindjendje, Mission of Cubal, Mission of Kalukembe, Mission of Kola, Mission of Mussolo, Parish of Mapunda, Parish of Forte and the Community of Huambo. Outside the country: Opuwo and Omuthiya in Namibie and Porto in Portugal. The first eight missionaries arrived in 1946. Once the mission became a District, Fr. Emil Truffer, of Swiss nationality, became the Superior. The Region as such was created in 1964. The first Regional Superior was Fr. Eduardo Jud of happy memory, also Swiss; the first Angolan to be Regional Superior was Fr. Tarcísio Tchiheke, who is now director of CESAFE (La Salette Center of Formation and Spirituality). 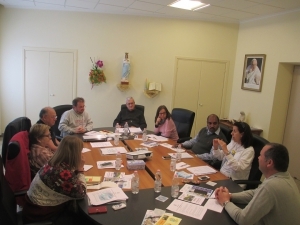 The Regional Chapter of 2009 took place from the 12th to the 19th of January at the La Salette Center for Formation and Spirituality (CESAFE). It was a good chapter, pointed in the right direction by an opening retreat preached by Fr. Dionísio, a priest of the diocese of Ondjiva (Cunene), who works for the CEAST (Episcopal Conference of Angola and São Tomé and Principe) as secretary for pastoral ministry. He first touched on problems concerning priestly and religious life with its ups and downs, and also the burning questions and challenges coming from today's world. Indeed, thanks to his ability to communicate well and offer deep reflections, the members of the Region were filled with a new spirit, which enabled them to renew their religious and priestly commitment. It can also be safely asserted that Fr. Dionísio mastered all questions. As he showed himself to be a man full of wisdom, the chapter members hoped that he would join us again in the future. We spent two full days listening attentively to his words, and we may affirm that this retreat proved to be a veritable balm for the smooth running and the success of the chapter. The most solemn moment of the chapter was the election of the new Regional Council, which took place on January 16. It is well to note that before each election, song and prayer to the Holy Spirit helped to create a calm, fruitful and positive climate within the chapter assembly. Fr. Venâncio Nunda, M.S. was reelected Regional Superior almost unanimously (46 out of 50 votes). The same day were elected Fr. Lourenço Flaviano Kambalu, M.S. as Regional Vicar, and Fr. Gabriel Ngonga, M.S. as Second Regional Assistant. It was a real grace for the capitulars to have with them Fr. 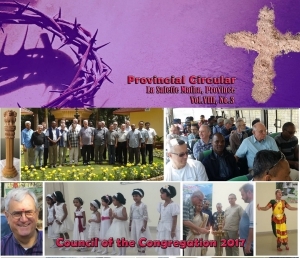 Leslaw Panczak, General Assistant and delegate of the Superior General to be present at this event. With Fr. Leslaw we were able to feel the presence of the Congregation, and he showed us how to love one another. I thank him sincerely for his presence in Angola. By Fr. ANTÓNIO DOS SANTOS TCHINDAU, M.S. The origin of the La Salette presence in Argentina is linked to the International Eucharistic Congress held in Buenos Aires in 1934. The papal delegate for the Congress was Cardinal Pachelli who later became Pope Pius XII. A delegation from Poland, headed by the country's cardinal primate, participated in the Congress. The Argentine bishops were aware of a wave of Polish immigrants and, eager to care for their pastoral needs, put out call for polish missionaries. La Salette responded with a visit in 1937 by the then Polish Provincial Fr. Kolbuch and Fr. Edward Sudyka. The decision was made and Fr. 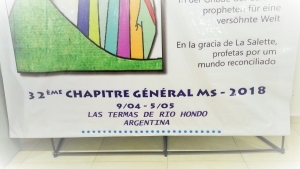 Sudyka was named to the Parish of San José in the dioceses of La Plata, Buenos Aires. Nearby Doc Sud offered the first contacts with polish immigrants. From the beginning the Missionaries of La Salette attended to the needs of the immigrants and of the local people as well. The eventual arrival of Frs. Luis Zawisza, Casimir Kornafel, Joseph Paprocki, Ladislau Pykosz as well as Bros. Juan Maszczak and Adalberto Cieślak fortified the new mission. After a time given the commitment by other congregations in the area to the polish immigrants it was decided to leave Doc Sud and take on missions in the eastern province of Santa Fe as well as Córdoba. Eventually two parishes of Our Lady of La Salette, one in Barrio Candiotti, Santa Fe and the other in Yofre Norte, Córdoba were established and continue to receive the ministry of La Salette Missionaries. The invasion of Poland by Nazi Germany in 1939 made it impossible to send more missionaries and having serious consequences for community life and the economic support from Poland. The small missionary band found itself fighting for survival. A magazine was started, Message of La Salette, through which for many years La Salette was made known .With a great desire for a permanent La Salette presence in Argentina the first apostolic school was opened in Barrio Patricios, a neighbourhood in Córdoba, attracting mostly poor children of polish immigrants living in the north eastern province of Chaco. Not long after, preoccupied for the quality of education, a proposal to assume the administration of a boarding school in rural Santa Rosa de Rio Primero in Córdoba was accepted. During World War II the religious congregation administering the school had been called back to France to complete their obligatory military service. For the next seven or eight years the missionaries, with the help of Fr. Dantin who had returned to France from Madagascar, administered the school and maintained their own formation program for the candidates. Fr. Dantin of the French Province died and was buried in Santa Rosa de Rio Primero. The desire to improve even more the quality of the formation led to a decision to buy, with the help of the polish American fathers and brothers in Olivet, a 15 acres piece of property in Pilar some sixty kms. North of Buenos Aires. The proximity of various seminary faculties in the area promised a better quality formation. Fr. Casimir Kornafel, who for some nine years was pastor in the most southern part of Buenos Aires province, accepted to prepare the property and with the help of the seminarians put it into shape constructing two small buildings with chapel, dormitories and class rooms in addition to the small chalet already on the property. With a doctorate in philosophy from the Gregorian Fr. Kornafel was a farmer at heart and quickly turned the property productive. Unfortunately, according to Fr. Kornafel, almost all the seminarians, apparently exhausted from the hard work involved, abandoned Pilar to return to their homes. Meanwhile several seminarians had advanced to philosophy and were given the opportunity to study at the Gregorian. Fr. Joseph Frydryk, who died in 2007 and is buried in Córdoba was the only candidate to reach ordination. Fr. Kormafel remained in Pilar until his death in 1990. In 1991 Fr. Zawisza died in Córdoba. They are both buried in the cemetery of the town of President Derqui where Fr. Louis had been pastor for many years, not far from Pilar. Meanwhile the parishes in Santa Fe and Córdoba continued to be attended to by Fr. Paprocki and Fr. Pykosz with help from various missionaries from North America. Fr Paprocki died as pastor in Santa Fe in 1975 and is buried there. Fr. Pykosz returned to Europe and others decided to go to the Polish American province of Olivet in the USA. Another door was opened when the political situation in Burma, now Myanmar, made it impossible for the American province from Hartford to reinforce its presence there. The General Council recommended Argentina as a future mission in the light of Pope John XXIII's call to reinforce evangelization in South. America. After a visit by the provincial, Fr. Michael Cox, the decision was made to send as a province commitment the first three Americans Fathers John Bradford, Steve Krisanda and Jim Weeks. With a desire to be considerate and not give the impression of taking over the mission from the Polish Fathers the parish of Our Lady of Perpetual Help in Las Termas de Rio Hondo, in the poor northern province of Santiago del Estero, was accepted in response to the local bishop's (note) desperate need for resident priests. La Salette continues to minister in this large mostly poor and rural parish. Given the absence of an apostolic school and the departure of the polish fathers from Córdoba it was decided to open a house of Formation in Yofre Norte, Córdoba. The first seminarians lived in the balcony of the parish hall where the American La Salettes had now assumed responsibility for the Parish of Our Lady of La Salette. It was eventually moved to, and continues to function in a spacious house on property acquired by the polish fathers in the same neighbourhood. Meanwhile with the continuing arrival of missionaries from the states and the collaboration of Fr. Joseph Frydryk, the expansion of the mission included in Córdoba the rural town of San Agustin, and the founding by Fr. Frydryk of a much needed parish in the populous neighbourhood of José Ignacio Diaz. In Santiago del Estero the expansion reached for a number of years the very large rural parish in Clodomira and eventually the establishment of a new parish, Our Lady of La Salette, in the city of La Banda, where La Salette continues to be present. With the establishment in 1976 of the last of the military dictatorships, following fifty years of rotating dictatorships with democratic interludes, the missionaries faced along with thousands of Argentines and others a dark chapter in La Salette´s history in Argentina. The novitiate house located in Barrio Los Boulevares, Córdoba was ransacked by military in plain clothes. As Fr. Weeks and now Fr. Alfredo Velarde along with other seminarians returned to the house they were accused of subversion and kidnapped. They were eventually held secretly in one of the notorious torture centers, La Perla. Thanks to the quick action of Fr. Jerry Biron and the intervention of Cardinal Primatesta they were located and eventually released. Fr. Weeks was deported and the others were eventually sent to continue their formation in the USA for a year. Their only subversion had been to evangelize in a very poor part of the sprawling city of Córdoba. Eventually the Region of Mary Queen of the Apostles with the same missionary spirit of the founding pioneers extended itself in 1985 to Bolivia with the help of Fr. Weeks who had continued to minister in Peru. In 1989 a tragic accident took the life of then Regional Superior, Fr. Roland M. Nadeau. He is buried in Las Termas. The recent death of fifty year old Argentine Fr. Francisco "Pancho" Negri, now buried in Córdoba, stretched the limits of the region. Relief has come with the arrival from India in 2008 of Frs. 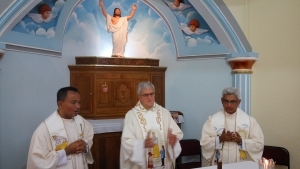 Jacob Vettathu and Joseph Peethuruthel, and the recent ordination of Bolivian Fr. David Cardozo. We also expect to have several novices next year. Today, we minister in Argentina in three parishes, in one neighbourhood of a diocesan parish and in our two houses of formation. In Bolivia we serve in one parish and in our house of formation in the central Bolivian city of Cochabamba. We are La Salette Missionaries from Argentina, Bolivia, the United States and India, grateful to the early Polish Missionaries who paved the way. "Well, my children, you will make this known to all my people." When the Blessed Virgin spoke these words to the shepherd children on the mountain she knew well that the simple children could only begin the work of telling her story to the world. Though no one then realized it, in all her wisdom she looked far across the mountains, over the vast seas, seeing scores of dedicated servants carrying her timeless message to all peoples everywhere - the Missionaries of Our Lady of La Salette. Since the Virgin first spoke to the shepherd children in 1846, not many pages had turned in the book of history when, at the end of the century, France was swept by an anti-religious uprising striking at all Religious Orders without regard. The relatively new Order had not the numbers, houses nor strength to withstand the persecution of governmental legislation and the ensuing violence. 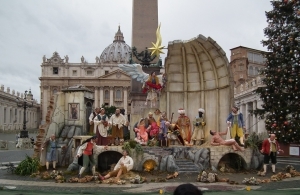 The La Salette Superiors and the priests moved to friendlier countries of Belgium, Switzerland and Italy. They left their beloved France not to run away, but to preserve their strength so they could help her again when the time came. And come it did, eventually. Meanwhile, the move turned the Order's eyes still to other lands where they could bring the La Salette Story to countless more and in turn draw new strength for the Community. So it was that in 1892, Fathers Pajot and Vignon took leave to sail for America where, two weeks later, they landed in Montreal, Canada. They were warmly welcomed by the Archbishop but there were so many Religious Orders already part of the Archdiocese that the Bishop had to refused them permanent residence. With characteristic La Salette optimism and faith, two priests set out for the United States though they knew but a few words of English. In the United States they met with Bishops of New York, Brooklyn, Albany, Syracuse, Ogdensburg and Newark, New Jersey. All welcomed the priests of La Salette but all had valid reasons why acceptance of the Order in their dioceses was impossible. But then, undoubtedly guided by the presence of Mary, the two priests stopped at Hartford, Connecticut where at the Cathedral they met Father William Harty, a member of the Bishop's Council. Father Harty had promised the Blessed Virgin to work for the establishment of a religious Congregation devoted to her and he welcomed the two priests as envoy of his promise. It was not long before the Congregation was received into the diocese of Hartford, their first firm root in the United States. But this root was to grow rapidly as the Fathers not only staffed a parish in Hartford, preached retreats and missions, but spread the warmth of the La Salette Story, the wondrous story of the two children who triumphed over all small and cynical people through devotion to our Lady. Soon after its creation in 1945, the Immaculate Heart of Mary (IHM) Province (with ministries and offices within Massachusetts and New Hampshire States) immediately begun community discernment vis-a-vis its missionary zeal and undertaking. Deliberations tapered down to either to help out in Madagascar or to implant La Salette presence in a different country. 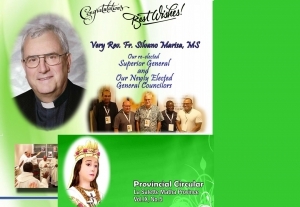 The province opted to respond to the urgent plea for personnel from the Most Rev. Constance Jurgens, a Belgian CICM, Bishop of the Diocese of Tuguegarao (Cagayan Province), particularly in the province of Isabela where parishes and big communities were left without priests. Bishop Jurgens knew of the La Salettes as many of the older members spent their studies in Belgium, and where he would have extended the invite to Fr. Elmeric Dubois, M.S., the IHM Provincial Superior then. After a visit which was well received, Fr. Dubois made a determination to accept Isabela from Jones to Gamu via San Mateo. In 1948, Fr. Joseph Imholf, MS, the La Salette Superior General granted the permission to the province of the Immaculate Heart of Mary to establish a La Salette foothold in the Philippines. On November 5, 1948, four La Salette Missionaries, Fr. Conrad Blanchet, Fr. Raymond Leduc, Fr. Paul Douillard and Bro. Donat Levasseur left by boat from New York via the Panama Canal, taking six weeks to reach Manila. They reached Manila on December 12. They finally arrived in Santiago, Isabela on the 22nd of December 1948.